Birch Firewood - What's The Best Species To Burn? The quality of birch firewood can range from excellent to moderate depending on the species of birch you are using. Birch are usually small to medium sized trees that grow in lowland areas and have shallow root systems. These trees are probably best known for their unique bark. As with most trees there are several different species within the birch family, but the yellow birch and the black birch produce the best firewood. Another common species of birch called the white birch can also be used for firewood but it doesn't supply as much heat as the yellow or black birch. To learn more about each tree and their firewood characteristics lets take a closer look at each individual species. The black birch, also known as mountain mahogany, sweet birch and cherry birch, is probably the most desirable firewood within the birch family. The wood has dense fibers which allows it to burn long and hot. These qualities alone make it a prized firewood. The black birch also has a unique sweet smell when it burns. As with most birch species it's recommended you cut and split black birch as soon as possible after felling the tree for optimal seasoning. This is due to the high sap content within the tree. 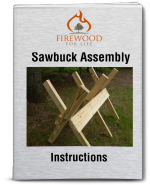 The black birch is arguably among the top desirable firewood choices of all wood types. The yellow birch, or swamp birch, is identified by its silver-yellow smooth bark. As it ages the bark starts to curl back giving it a unique appearance. The yellow birch is a hard, strong, dense wood used in making furniture. The density of the wood makes it an excellent firewood choice. Another identifier of the yellow birch is the wintergreen aroma emitted when it's burning. Yellow birch does have a few drawbacks. It's hard to split and it dries slow. It's recommended you cut and split the yellow birch as soon as possible after felling to allow the wood to properly season. It's important to expose the wood surface to air and allow it to dry due to the woods high sap content. The white birch, or paper birch, is best known and used for its bark. It has white, thin, paper like bark with dark thin horizontal stripes. The bark is waterproof and has been used in making wigwams, canoes, bowls and many other things. 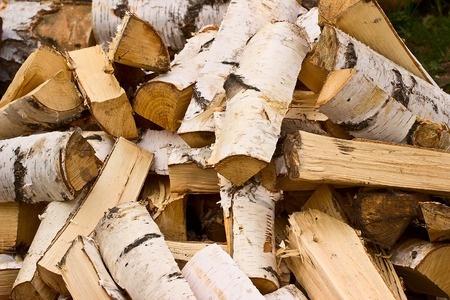 The wood fibers are not as dense and strong as the black or yellow birch resulting in a lighter wood that is an inferior firewood choice compared to the other two. The bark on the tree tends to hold in the moisture making white birch difficult to season. It's important to split white birch into small sections and give the wood plenty of time to dry. Also, make sure not to stack the wood directly on the ground because white birch is known to quickly decay if left exposed to the elements. The white birch is just an okay, middle of the road firewood choice, but it can supply decent heat if properly handled. One of our visitors explains his experience using birch firewood to heat his home. "We heat our house with wood and I came across your site when researching Birch. This is what I've found with 4 winters of not using the oil burner. I have experience with Oak, White Ash, Chestnut, Cherry, Maple and now Birch. I didn't prepare enough wood for this year so I had to buy a couple of cords, and my source is predominantly Birch. Oak, far-and-away produces the most heat and burns the longest. A couple of medium-sized logs in the stove will burn for a couple of hours, giving me about 400 degrees, and if I load-up the firebox with oak it will pass 500 degrees. It's the best wood to heat-up the house in the morning and to keep the chimney clean. White Ash, Chestnut, Cherry and Maple each have unique qualities, but are generally similar in terms of heat, length of burn and coaling. Usually 350-400 degrees, 45-60 minutes of burn and a couple of hours of good coals. Birch is both a blessing and a curse. It produces only about 250-300 degrees, seems reluctant to burn and produces a high amount of creosote (based on the build-up I see on the stove's glass door), yet it goes to coals very quickly and stays in coals for a long time. So, for actually getting the house warm in the morning it's not ideal, and the coals take-up a lot of space, producing not-enough heat… however, for sustained heat overnight or if we're gone for most of the day I can load-up the firebox with this and will still have usable coals 6, or even 8 hours later (if I cut the oxygen). The stove might be only 150 degrees at that point, but I'll take it since I don't get that much coal from the other woods." Black birch will produce 26.8 million BTU's per cord. Yellow birch will produce 21.8 million BTU's per cord. White birch will produce 20.2 million BTU's per cord.